After the Loch festival, I’ve been laying low – also because of some dental work, oy! – but I’ve been pottering away at some thing here and there, and I also had my phone upgraded to an iPhone 4S, so I figured I’d test out the camera and show you some stuff! First up, while I was visiting my folks over Christmas, I’d decided that I was going to knit my Ma some socks. She’d bought me the book “Closely Knit” by Hannah Fettig for a Christmas gift, and then I asked her to pick out some sock yarn. Now, Spotlight in a smallish-biggish town doesn’t have the greatest selection, and the yarn my Ma chose didn’t even have a ball band, so I’ve got no idea what it is. It’s not what I’d have chosen for myself, but it’s not for myself, now, is it? I like to call him "Halfie". At any rate, I’ve knit the first sock which I’ll send to Ma for a fit before I do the other. I feel like it’s a little big (considering it fit me comfortably), but I knit it by the pattern according to shoe size and my Ma’s foot length, and my tension was slightly tighter – maybe two or three stitches less over four inches – so, I dunno, I’ll see what she thinks when she tries it. The pattern in the book was really easy to follow, and explained the stuff I hadn’t done before really clearly. I’d never done the folded picot edge before, and I probably squealed myself silly when I’d done it and declared “I’M GOING TO KNIT ALL OF THE THINGS WITH A PICOT EDGE!!!“. Also, I’d never done a top-down sock or used Kitchener stitch to cast off before, so they were good times had. It wasn’t all fun and games, obviously. It never occurred to Little Stupid here that knitting a heel flap with self-striping yarn looks pretty naff and I ought to have used a plain yarn or an afterthought heel. Which I already knew, but my mind left me for the duration of this sock. I particularly hate the single-row stripe on the top of the foot. Oy. Well, next time I shan’t be so daft, promise. Another weird thing: my stitches are usually quite even and neat, but they’re a little bit cray-to-the-azy here… I did notice that the yarn was particularly twisty and I had to de-twist a LOT more than usual, so I’m going to put it down to that. Anyway, the book is super nice, and I’d definitely recommend it. For the Australian peeps, Ma and I found it at Lincraft for $7, which is a serious find considering how neat this book is. I almost felt like we were stealing it, y’all! 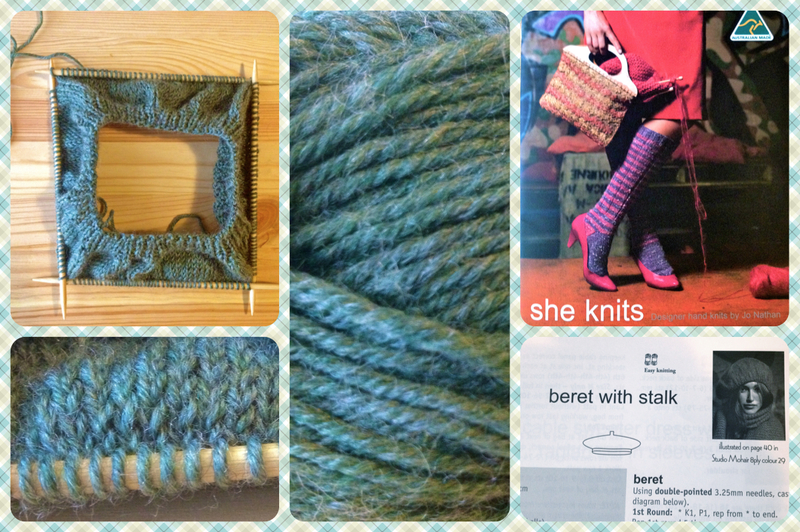 Anyhoo, I’m planning to knit up a few of the projects and reviewing it. Hands up if you’re interested. There’s also a really nice plain sweater for gentlemen in here that I’m pondering. Meanwhile, all summer my receding hairline and I have been bemoaning my lack of summer hats to hide my hair trauma and prevent scalp sunburn, but other things took precedent and I neither bought nor made any. And then, after Loch, I figured I’d put my new-found crafting freedom towards more hats, but really, summer’s nearly over, so I thought to heck with that idea, I’ma make me a new beret! I do love a good beret. So, I pulled out this Cleckheaton book, “She Knits” and, FYI Cleckheaton, He Knits too. Gettin' my beret on. Well, not for a while yet. Now, I love the Cleckheaton Country yarns, but I love Morris Estate better, so I bought myself some balls of Estate 8 ply in a lovely dusty, tweedy green (Sage 8046) and got started. It was really hard to make the color to come through accurately on my iPhone, so you’ll just have to trust me on this one. It’s green and yummy; truth. I know, green is so unusual for me, right? The pattern is not the most exciting thing as far as knitting it goes, but it’ll be a nice pick-up-put-down project while I do other things. I’ll keep you posted! To finish off, I wanted leave y’all with a song! It’s been a while since I’ve shared some tunes, and this album is making me fall in love with it all crazy-like, so here ’tis. I love me some shimmery, shiny, melancholy, synthy deliciousness. Do like knitting socks? How do you deal with Second Sock Syndrome? Also, feel free to share your fave tune of the moment! Commentses? I heart them! Cheers and applaud on the sock! 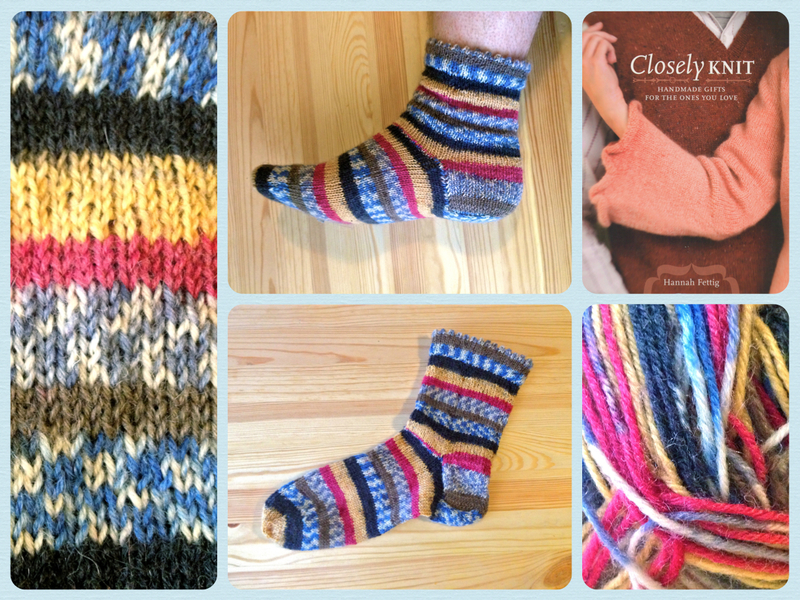 I know you’ll find it in you to get over the “second sock syndrome.” Such a clever name for that, ha! I experienced that a bit while making my leg warmers — it took me weeks before I started the second one, and since I used my own craftyness instead of a pattern I had to count my stitches numerous times..! Yuck-o. Ooh, snap! I’ve got that Hannah Fettig book too, I made the “man socks” for my dad. Cant wait to see the beret on you!! with the Picot edge?? Oh I think the beret will be amazin looking! I love that you say peeps too btw hahaha! I love the sock….lol cozy! honestly, i HATE knitting socks. the construction is fun (magical, even) but I find them dead boring. AND sock yarn is EXPENSIVE. I do a pair a year, tops. haha.